The Vikings trimmed their roster to 53 players before the NFL mandated roster cuts deadline on Saturday. With 26 players on offense and 24 on defense, the roster structure is distributed fairly evenly. Daniel House provides his takeaways from the Vikings roster cuts. The Vikings trimmed their roster to 53 players before the NFL mandated roster cuts deadline on Saturday. With 26 players on offense and 24 on defense, the roster structure is distributed fairly evenly. The coaches kept four tight ends and six wide receivers on offense. Backup offensive line depth was a major concern and the front office addressed this by executing a trade with the San Diego Chargers. Ian Rapoport of NFL Network reported the Vikings sent a sixth round pick to the Chargers for Jeremiah Sirles. He can play both guard and tackle along the offensive line. Sirles graded well in the preseason and adds depth to a weak backup Vikings offensive line. On the other side of the ball, Mike Mauti was released and the team kept rookie seventh round draft pick Edmond Robinson instead. Brandon Watts was also released and the Vikings only kept six linebackers. Finally, Anthony Harris was cut and the coaches are going with four safeties on the active roster. If he isn't claimed, don't be surprised if Harris doesn't slide onto the practice squad. Five defensive ends made the final 53-man roster, including four more interior players. With other teams cutting their rosters, the Vikings are going to be tweaking this list of guys and might add another player at a position that needs an upgrade. My Take: Taylor Heinicke did enough in the preseason to prove he was worthy of a roster spot. He is young and can fit very well in this system as the third quarterback. 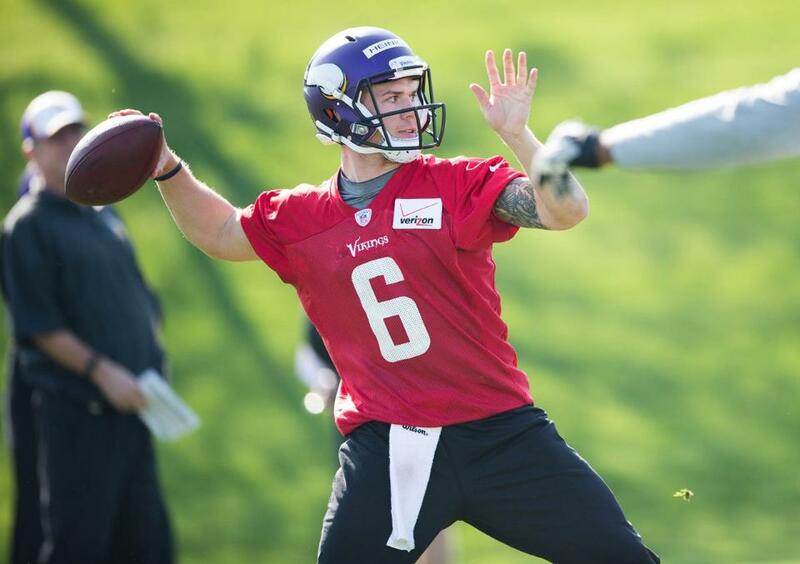 When Shaun Hill decides to hang it up, Heinicke can become the second-string quarterback. There was no way he could be slid onto the practice squad without being snatched by another team. The coaches made the best decision to keep him on the active roster. My Take: Coming into today's roster decisions, the top three running backs were locks. The coaches have faith in Zach Line and decided he will play fullback this season. His versatility probably played a role in this decision. He can play special teams and will take snaps at running back if injuries deplete the depth chart. By making this decision, the team managed to keep Chase Ford on offense. However, it was at the cost of losing a player like Mike Mauti. Line needs more playing time and it will be very interesting to see how he blocks for Adrian Peterson when the regular season begins. My Take: This really is no surprise. The Vikings are extremely deep at wide receiver and had to keep all of their talent at the position. Adding Stefon Diggs in the draft only made this group stronger and will ensure the offense has plenty of playmakers. My Take: Earlier in the week, I didn't think there was much of a chance for Chase Ford to jump onto the 53-man roster. I really started to question it after he missed Thursday's game with an injury. However, his entire body of work was enough for him to make this team. He fits the system well and has proven himself as a playmaker. He'll be stacked behind Kyle Rudolph and rookie MyCole Pruitt, but he could see more time if Rudolph can't stay healthy again. My Take: The Vikings walked away from 2014 draft pick David Yankey and needed to address the swing tackle position. They traded for Jeremiah Sirles with the San Diego Chargers to help bolster this weakness. Sirles had an excellent preseason and can play both guard and tackle on the offensive line. Zac Kerin was on the practice squad last year and did enough this off-season to improve his overall game. He was more versatile and his physicality really showed in training camp practices. The offensive line depth looks better than it did entering today and that definitely leaves room for optimism. My Take: The team had to keep five defensive ends in order to have Justin Trattou on the roster. The starting rotation was set in stone, but the final three spots were relatively open-ended. Danielle Hunter is a project for the future and Scott Crichton progressed this off-season. Justin Trattou had an excellent preseason and has grown so much since he has played in this system. The Vikings have a deep group of defensive lineman and will rely heavily on all of them to rush the passer effectively. My Take: Mike Mauti was released and the coaches decided youth was more important. Earlier in the day, it was reported he was going to make the team, but the coaches must have changed their mind. Edmond Robinson is young and has all the tools to fit in this system. If you were going to release a player, you had to choose the one that will come back to haunt you the least -- that's Mike Mauti. The Vikings have plenty of young depth at this position and will need to find creative ways to have Kendricks, Barr, and Hodges on the field at the same time. My Take: Marcus Sherels stuck on the roster again because of his contributions on special teams. He won't provide much as a defensive back, but can be somewhat serviceable. Jabari Price returns after two games and we will see if Sherels holds on past week two. Captain Munnerlyn's situation has been somewhat puzzling, but it wasn't crazy enough for his job to be in jeopardy. Safeties (4): Harrison Smith, Robert Blanton, Andrew Sendejo, Antone Exum Jr.
My Take: The biggest surprise at this position was the release of Anthony Harris. This group was stacked with players who can contribute and there simply wasn't enough room for him to crack the roster. He might be a candidate for the practice squad, but it seems likely he could be claimed by another team in the league. The Vikings have high faith in Exum Jr. and Sendejo is a solid contributor on special teams. My Take: The long snapper battle ended a few weeks ago and that has been put on the side burner. Now the limelight has shifted towards Blair Walsh's kicking inconsistencies in the preseason. No moves were made, but he will need to figure this out before the regular season begins.